Accessible but authoritative, the Walt’s People series is the world’s best-known, most widely used multi-volume resource about Disney history. In volume 14, Didier Ghez and a dream team of Disney historians, including John Canemaker, Leonard Maltin, Jim Korkis, Dave Smith, Michael Broggie, and many others deliver another priceless payload of stories from Disney artists, animators, executives, and Imagineers who worked with Walt Disney, or had key roles in the development of Disney films and theme parks. The interviews and articles in Walt's People represent a treasure trove of research for Disney scholars—but more important, they're entertaining, down-to-earth stories that will please any fan eager to learn more about Disney. 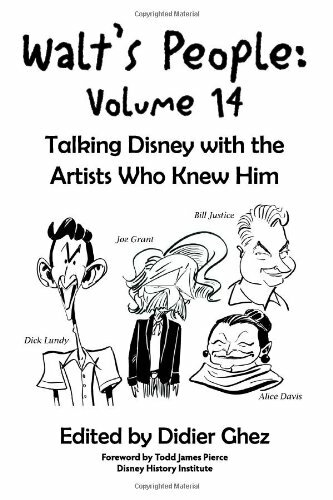 You don't need a Ph.D. in Disney Studies to enjoy the recollections and anecdotes from such Disney luminaries as Admiral Joe Fowler, Bill Justice, Joe Grant, Eddie Sotto, and over half a dozen others. Marge Champion remembers what it was like to dance and model as the live-action reference for Snow White. Alice Davis reveals the trials and tribulations of designing clothes for the pirates – and the Redhead – in Pirates of the Caribbean. Bob Mattey explains how he built the animals for the Jungle Cruise, and the many things that went wrong. Admiral Joe Fowler talks about facing down gunboats in 1920s China and buying up land for Walt in Florida. Eddie Sotto describes fascinating attractions never built, including piranha pits, a new Jungle Cruise based on Apocalypse Now, and an encounter with Maleficent in the Dragon’s Lair. Start prepping for that Disney Ph.D. today with Walt's People: Volume 14!